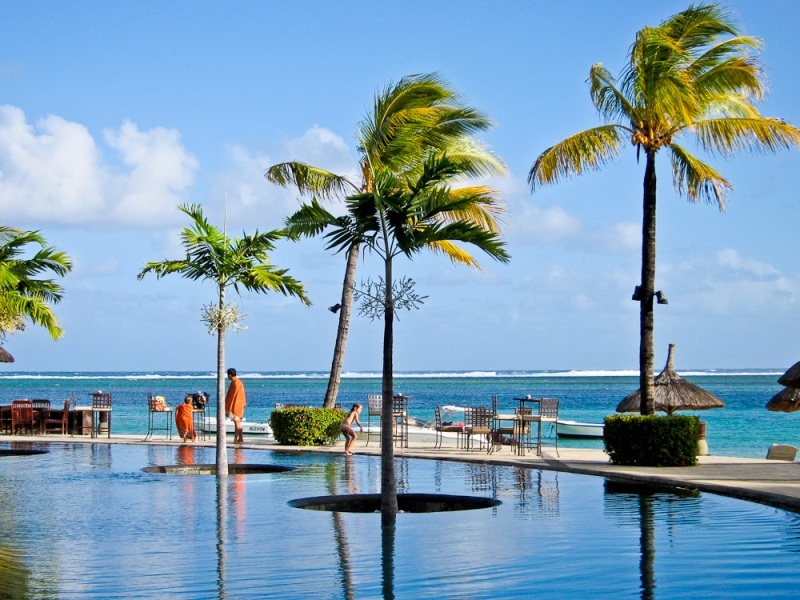 Mauritius – the perfect Wedding or Honeymoon at Heritage Le Telfair Golf & Spa Resort. 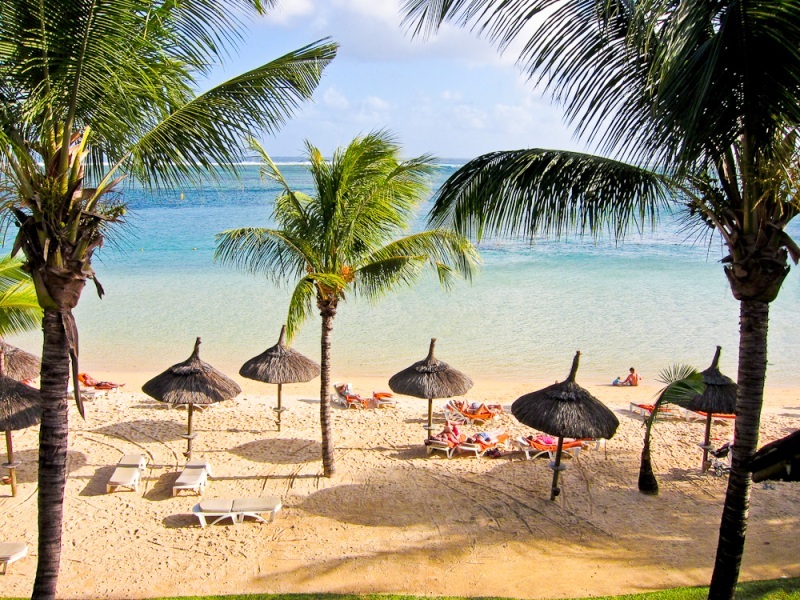 Relatively undeveloped, the south of Mauritius is home to some of the country’s most wonderful scenery and wildest landscapes. It’s fitting, therefore, that the Domaine de Bel Ombre, an old sugar plantation, contains not only a 5 star luxury hotel but also an extensive nature reserve populated by wild deer and exotic birdlife. I’m sitting in Le Château de Bel Ombre, the original manor house of the plantation, feasting on delicious gourmet Mauritian Creole cooking. Surrounded by discreet waiting staff, in the wood panelled dining room, it’s easy to imagine you’ve slipped back in time, as you sip the fine wines and make delicate conversation. 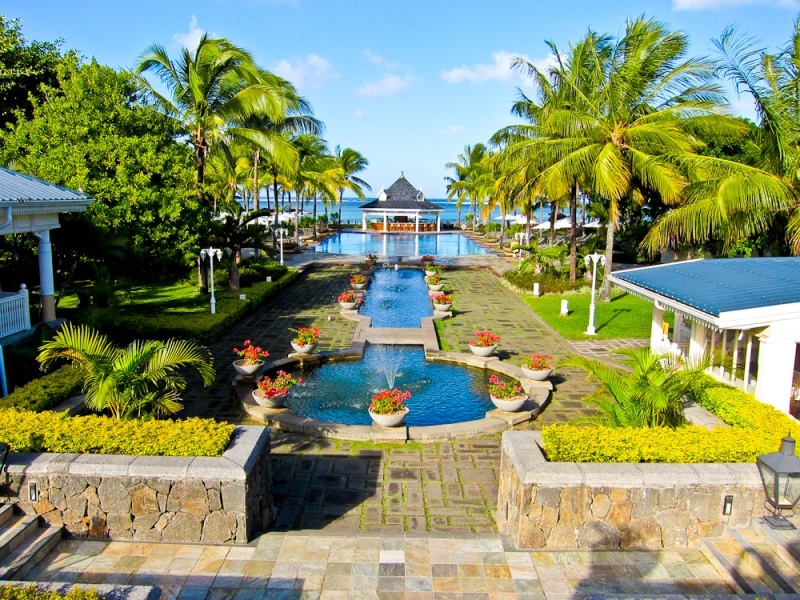 The Heritage Le Telfair Golf and Spa resort ( www.heritageletelfair.mu ) gets its name from Charles Telfair, a famous British naturalist, credited with introducing bananas to Mauritius in 1826. He lived in the area in the 19th century but I doubt he ever dreamt of luxury like this. He’d recognise the style of the 158 rooms and suites, as all take inspiration from his era – you could call it classical colonial with a modern spin. You have a choice of an ocean or a river view and all come with floor to ceiling French windows and private balconies or verandas. Inside it’s all planter’s chic with dark timber floors, reproduction period furniture and a fabulous fixtures and fittings. I’m in a Junior Suite with a large poster bed and a glorious sea view from my balcony. 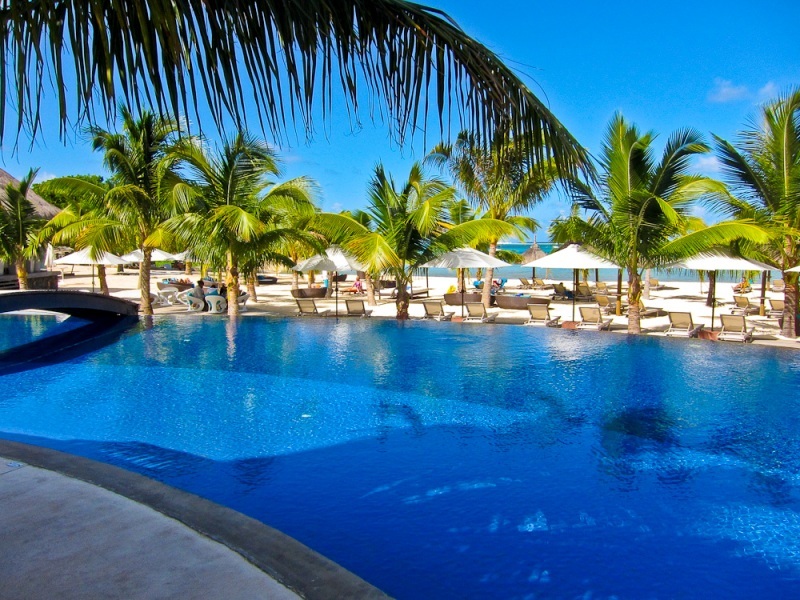 Of course this haven of luxury and splendour is a dream destination for honeymoons and weddings. They’ll arrange everything including setting up the ceremony, photography, beauty treatments, live music and flowers. You’ll be provided with a lavish dinner and a honeymoon breakfast and have the services of a private butler during your stay. They’ll even throw separate bachelor & bachelorette parties on the eve of the wedding then, on the day itself, you’ll be transported in a decorated buggy to Le Château de Bel Ombre garden for the ceremony. 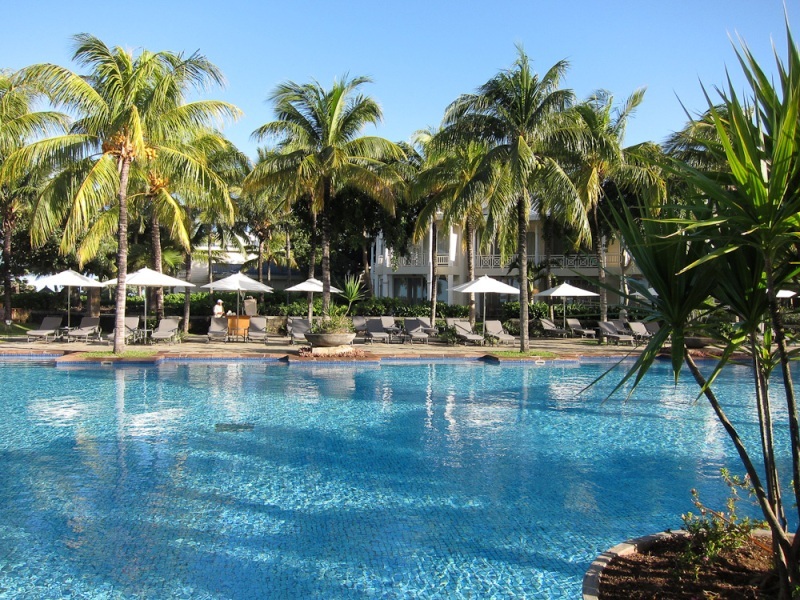 The great thing here is space – the Heritage Le Telfair occupies 15 acres in a lush green setting with soaring tropical palms waving in the breeze, and it has its own magnificent 18 hole golf course. If you don’t fancy the sea there’s a huge infinity swimming pool and a slightly smaller second heated pool. The Seven Colours Spa has every sort of massage and treatment you’ve ever dreamed of and there’s a special wedding package which includes a massage or facial for bride and groom in the couple suite. Just a short distance from the hotel is the Frederica Nature Reserve, 3500 acres of green wilderness protected by the Mauritian Wildlife Foundation. You can go quad biking or hiking, but I opt for the jeep tour, a slightly more comfortable option. It’s recently rained so the steep forest tracks degenerate into slippery mud, in places, but that adds to the sense of adventure. My guide points out exotic plants, rare birds and then finally we come face to face with deer by the dozen. They’re ranged against the side of the hill and seem to have no fear – they just stand and watch us curiously. Apparently there’s a thriving population of over 3500 and they need to be culled to keep the numbers stable. You can go on guided hunting expeditions and venison is often served at the hotel’s table. 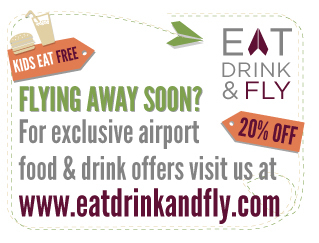 Speaking of food, there’s an extra-ordinary choice of 11 restaurants available, all within walking distance of your room. You’d be hard pressed to eat at all of them during a week’s stay but I do make a valiant attempt. 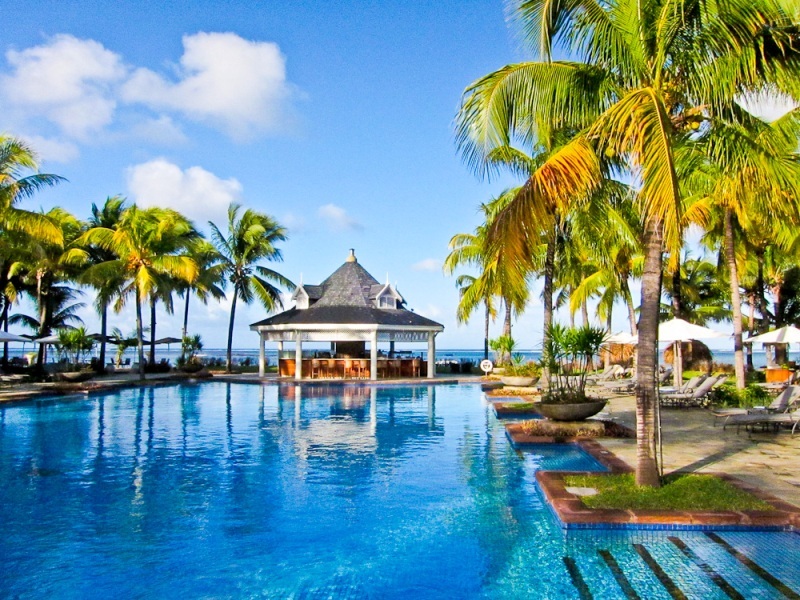 As well as Mauritian cuisine, you can sample a range of international styles in a variety of settings, whether it be poolside, beach barbecue or fine dining. A stand-out is restaurant Gin’ja where talented Vietnamese chef Van Pham Thong serves up Asian flavours. A tasting platter of sushi, tiger prawn tempura, and Peking duck rolls is followed by a delicious Teriyaki beef fillet with spicy noodles. And I won’t easily forget his green tea orange cheese cake with pumpkin ice cream. Now, if you’re on your honeymoon or celebrating your wedding, you probably won’t want to venture out to the world outside but you’d be missing an opportunity to explore the unspoilt south of the island. 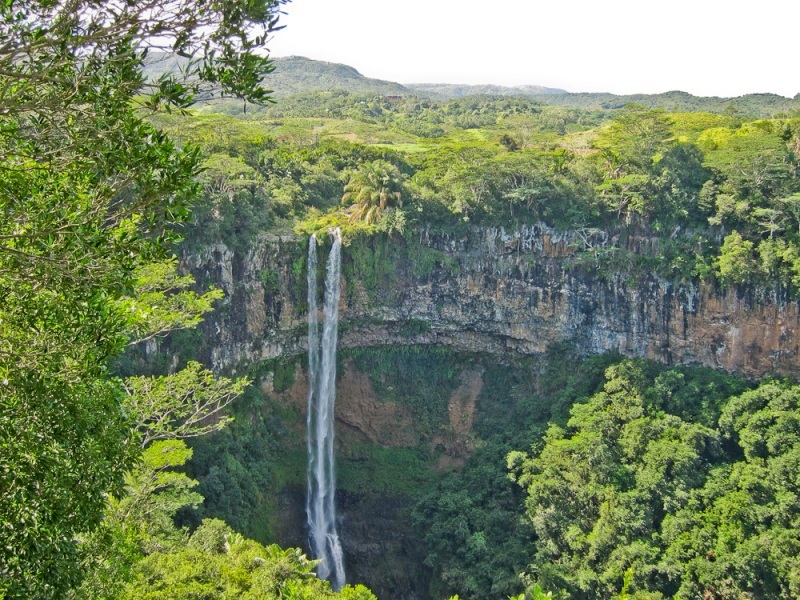 Connected to the Frederica Reserve is Mauritius’s only remaining indigenous forest, the Black River Gorges National Park covering 3.5% of the Island’s surface, and home to 300 species of flowering plants and 9 unique species of birds. There are stunning views over the park right to the ocean from the viewing platforms at Gorges and Alexandra Falls. Just nearby, a 33ft statue of Shiva signals the entrance to the crater lake of Grand Bassin, or Ganga Talao, the most sacred Hindu place in Mauritius, situated at 1800 ft. above sea level. There are temples dedicated to Lord Shiva and other gods including Hanuman, Lakshmi, lining the sides of the lake. Mauritian Hindus believe that the water inside the crater communicates with the waters of the holy Ganges so, once a year, most of the island’s Hindus come here for Maha Shivaratri celebrations to pay homage to Lord Shiva. Another day’s outing is a boat trip from Le Morne Anglers Club at Black River, to Île aux Bénitiers. After you cross the reef, suddenly you’re surrounded by dolphins, bobbing and playing in the waters. In theory you can swim with them, but by the time I’d jumped in, they’d sadly disappeared. I did get the chance, however to follow the multi-coloured tropical fish among the coral and then enjoy a barbecue lunch, anchored in the calm of the lagoon. On my last day in the resort, a multitude of activities beckon, including a round of 18 hole golf, kite surfing, water skiing, windsurfing, and canoeing. Instead I succumb to pampering in the spa and enjoy a relaxing massage, the firm fingers of the diminuitive Mauritian masseuse seeking out the twists in my knotted muscles. Finally I’m lounging on the spotless white powdery beach, staring out to the coral reef across the translucent blue waters. I close my eyes and imagine I’m in paradise and, you know, that’s not too far from the truth. 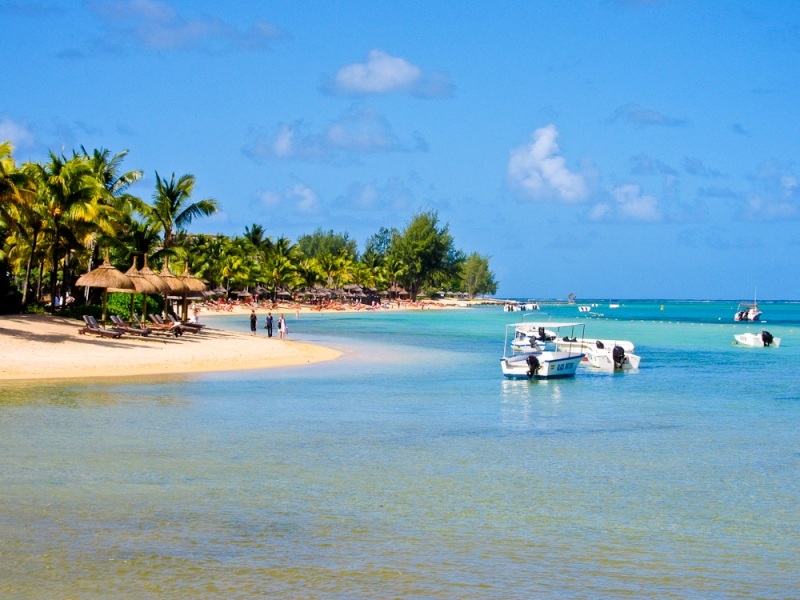 Air Mauritius flies direct from London’s Heathrow Airport. 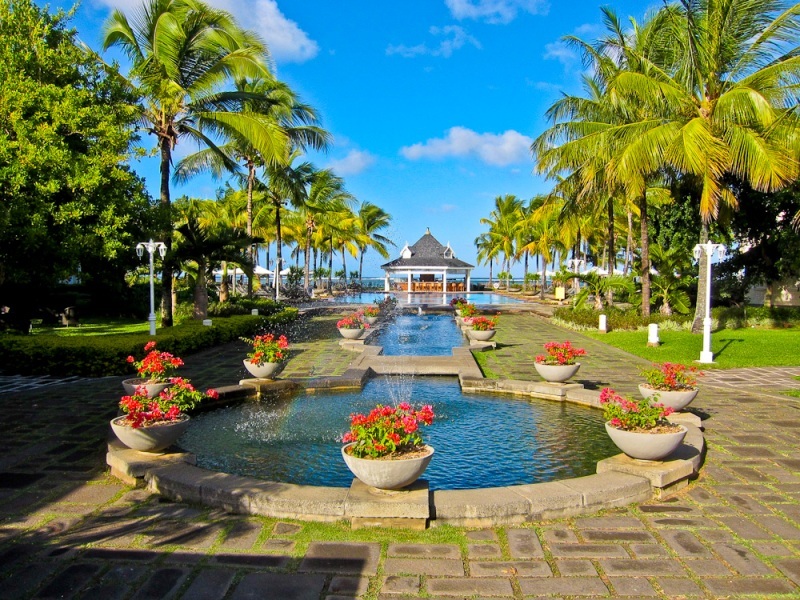 The Mauritius Tourism Promotion Authority has detailed information about the island. Well done, nice description as I had seen it in March. I’m planning to be back at the Telfair next year – without marriage ;-).